If you asked us why we should visit New Orleans, we could talk to you for hours on end. From world class food, music, architecture, museums, sporting events, festivals, and shopping, New Orleans has something for everyone. New Orleans is unique, truly unlike any other city in the world. New Orleans and Southeast Louisiana is also know as sportsman’s paradise for its world class inshore and offshore fishing and excellent waterfowl hunting. However, we do admit that we are quite biased toward our city so don't just trust us-- see what these national publications have to say about the Big Easy! New Orleans is Number 1 on TripAdvisor’s list of “10 Best Foodie Vacations in the USA”, May 2018. New Orleans is Number 5 on TripAdvisor's "10 Best Food Cities & Food Tours in the World", May 2018. Expedia Viewfinder has named New Orleans one of the “Top-Rated Vacation Destinations in North America”, May 2018. 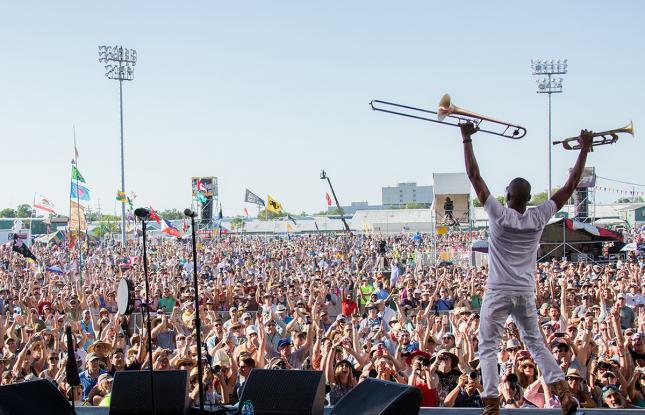 National Geographic Traveller UK has named New Orleans Number 1 on their list of of the “Top 10 Music Cities in the USA”, May 2018. TripAdvisor has named New Orleans one of the 10 "Most Excellent Cities Overall", June 2018. Fast Company has named New Orleans one of the "Best Cities for Biking in the U.S.", May 2018. HometoGo has named New Orleans in their list of "Top 50 Cities for Nightlife", May 2018. Audubon Zoo and the Aquarium of the Americas in New Orleans among the Top 10 attractions in the country, May 2018. TripAdvisor has named New Orleans one of the "10 Best Food Cities in the World", April 2018. Southern Living readers recognized New Orleans the "South's Best Food City" in their "South's Best" list, March 2018. TripExpert named New Orleans the "Best North American Destination" in their "Experts' Choice 2018", March 2018. Resonance and National Geographic have included New Orleans in their list of "America's Best Small Cities", January 2018. The New York Times has featured New Orleans as their Number One Destination on their list of "52 Places to Go in 2018", January 2018. The Irish Times lists New Orleans as #1 on their list of "52 Places to Visit in 2018", January 2018. AARP has named New Orleans Number 1 in their list of "Top U.S. Destinations for 2018", January 2018. The Globe and Mail's "Top 12 Travel Destinations to Keep Your Sights on for 2018" features New Orleans, January 2018. Expedia's Viewfinder Travel Blog has named New Orleans #1 in the "18 Cities that Must be Seen in 2018", January 2018. Thrillist has named New Orleans in their "18 Best Places to Go for a Big Trip in 2018", January 2018. Robb Report's "Best Places to Travel in February" features New Orleans, January 2018. Harper's Bazaar UK named New Orleans in their list of "Places Everyone Will be Going on Holiday in 2018", January 2018. Travel + Leisure featured New Orleans in their roundup of "Best Places to Travel in the U.S. in February", January 2018. Bloomberg included New Orleans in their list of "Where to Go in 2018", January 2018. CNN Travel's "Best Vacation Spots for 2018" features New Orleans, January 2018. The Los Angeles Times included New Orleans in their roundup of "Where are you Going in 2018", January 2018. TripAdvisor Blog's "30 Top USA Cities to Visit in 2018" featured New Orleans, January 2018. Conde Nast Traveler's "Best Places to Travel in 2018" included New Orleans, December 2017. ESSENCE released their "5 Beyonce- Inspired Trips You Should Take in 2018" with New Orleans included, December 2017. New York Times featured New Orleans in the "10 Bargain Destinations for 2018", December 2017. Thrillist included New Orleans in their list of "Best Places to Travel in February", December 2017. USA Today named New Orleans in their list places "Where US Travelers Will Explore in 2018", December 2017. Associated Press included New Orleans in their "Where to Go in 2018" roundup, December 2017. AAA Via Magazine included New Orleans on their "8 Great Places to Visit in 2018", December 2017.
Business Insider named New Orleans among the "13 Best Places to Travel in February", December 2017. Architectural Digest named New Orleans one of the “10 Places with the Wildest New Year’s Celebrations on the Planet”, December 2017. New Orleans was named in the top 10 of Zagat’s “30 Most Exciting Food Cities in America,” December 2017. TripAdvisor has named New Orleans one of the “20 Best Winter Sun Getaways America has to Offer”, December 2017. Conde Nast Traveler named New Orleans number five of their “18 Best Places to Travel in 2018”, December 2017. New Orleans was featured on Rough Guide’s list of destinations to visit in 2018, December 2017. Travel + Leisure announced their “50 Best Places to Travel in 2018”, and New Orleans was named among the list of national and international destinations, December 2017. Fodor's Travel listed New Orleans on their “Go List” as one of their 52 destinations to visit in 2018, December 2017. Frommer's Travel Guides included New Orleans as one of the “Best Places to Go in 2018”, December 2017. Influential travel blog, The Points Guy, included New Orleans on their “18 Amazing Places to Travel in 2018” list, December 2017. USA TODAY 10Best Readers' Choice named New Orleans as a “Best Place to Ring in the New Year”, December 2017. PopSugar.com named New Orleans one of “The World’s Top 10 Most Glamorous Cities to Ring in the New Year”, December 2017. USNews.com highlighted the “Best Winter Getaway” destination in each state, naming New Orleans as the best getaway in Louisiana, December 2017. Harper's Bazaar, Esquire and Country Living have named New Orleans one of the "Best Holiday Destinations for 2018", November 2017. Eater has named New Orleans' restaurants, Compere Lapin and Le Petite Grocery on their list of "America's Essential Restaurants of 2017", November 2017. Frommer's Travel Guides has named New Orleans one of their "Best Places to Go in 2018", November 2017. Travel + Leisure has named New Orleans one of "America's Friendliest Cities", October 2017. Conde Nast Traveler has named New Orleans as one of "The Best Big Cities in the U.S.", October 2017. Garden & Gun has named New Orleans one of the "South's 10 Best Food Towns", September 2017. Bon Appetit has named New Orleans' restaurant, Turkey & the Wolf the "Best New Restaurant in America", August 2017. Food & Wine Names New Orleans "One of the Best Food Cities in the World", July 2017. Travel + Leisure names New Orleans the "No. 4 City in the U.S.", July 2017. TravelWeekly has named New Orleans one of the "United States' Best Music Experiences", July 2017. Lots of golfing nearby! Check out our newest course only 10 minutes away! TripAdvisor has named New Orleans one of the "Top Value Cities for an Epic Getaway", April 2017. Southern Living has named New Orleans one of the "South's Best Cities", March 2017. TripAdvisor Vacation Rentals has featured New Orleans on their list of "Valentine's Day Travel Ideas in the Most Romantic Cities", February 2017. TripAdvisor named New Orleans one of the "Best Girlfriend Getaways You Can Take Without a Passport", January 2017. TravelBird named New Orleans 2016's Most Inspiring Cities, November 2016. New Orleans named one of the "Most Romantic Cities in America" by Thrillist, October 2016. The Culture Trip named New Orleans one of the "10 U.S. Cities that take Halloween Very Seriously", October 2016. New Orleans was named one of the top 5 "Most Fun Cities in America" by Wallet Hub, September 2016. TripAdvisor has named the National WWII Museum no. 4 Museum in the U.S., no. 11 in the world, September 2016. Travel + Leisure has named New Orleans "Number 2 Best City for Culture in the U.S.", September 2016. Travel + Leisure has named New Orleans "Number 1 City for Food in the U.S.", August 2016. New Orleans was named one of "2016's Top Labor Day Destinations" by HotelPlanner.com, August 2016. Elle UK named New Orleans one of the "Top 5 Music Destinations in the World", August 2016. New Orleans restaurant, N7, named in "Top 10 Best New Restaurants in America" by Bon Appétit, August 2016. Condé Nast Traveler named New Orleans number nine on the list of "Friendliest Cities in the U.S.", August 2016. New Orleans was named one of the "Top 10 Rising Star Foodie Destinations" by Gogobot, July 2016. TripAdvisor named New Orleans the number one "Most Affordable U.S. City," July 2016. New Orleans has been named one of the "World's Best Cities" by Travel + Leisure, July 2016. Travel + Leisure named New Orleans number two on its rankings of "The Best Cities in the U.S.," July 2016. U.S. News and World Report named New Orleans the number four "Best Affordable Destination in the USA," June 2016. New Orleans was named one of the "Best Cities for 4th of July Celebrations" by WalletHub.com, June 2016. Worth magazine named New Orleans one of the "15 Most Dynamic Cities in America," June 2016. New Orleans was named one of the "Top 10 Cities for Barbecue" by CheapTickets.com, June 2016. Cvent.com named New Orleans one of the "Top 50 Meeting Destinations in the United States, May 2016. New Orleans was named one of the "11 Best Cities in the US for Live Music" by Matador Network, May 2016. Gogobot.com has named New Orleans the number one "Rising Star Tourist Destination in North America," May 2016. New Orleans was named one of "America's Favorite Cities" by Travel + Leisure, May 2016. New Orleans was named the number one "Top 10 Summer Friday Destinations" by Kayak.com, May 2016. Thrillist.com named New Orleans one of the "10 American Cities with the Coolest Architecture," March 2016. New Orleans was named a "2016 Family Travelers' Rising Star Destination" by Gogobot.com, March 2016. TripAdvisor named New Orleans one of the "2016 Traveler's Choice Top 25 U.S. Destinations," March 2016. Travel + Leisure named New Orleans one of the "Best Places to Travel in March," February 2016. Readers of Travel + Leisure named New Orleans one of the "Best Cities in North America," February 2016. New Orleans was ranked number three on TravelSquire.com's "Top 28 Hot Destinations 2016," February 2016. New Orleans was named number one on TripAdvisor's list of the "7 Best Family Getaways in America," January 2016. ListsForAll.com named New Orleans one of the "Best Vacation Spots in the U.S.," January 2016. TripAdvisor ranked New Orleans one of the "Top 10 Winter Destinations," January 2016.